This is another of those traditional handed-down-from-grandma recipes that my mother makes and that I cant seem to duplicate, no matter what. Oh, I'm sure it turns out just fine, because after all it's her recipe that I follow. But somehow, that extra infusion - of taste, of aroma - doesnt seem to happen for me. There is a word in Tamil to define that elusive whatever-it-is that adds oomph to everyday food - kaimanam. The closest translation of that word is "aroma of the hand". Anybody who cooks probably acquires that quality to some degree, but there arent many who can evoke that feeling of warm contentment (home, family, food) in persons other than immediate family. As far as I'm concerned, anybody who can do that deserves the ultimate accolade. Fancy chefs with their fancy cooking dont hold a candle to all those unknown, unremarked yet fabulous home cooks out there. Ok, returning from the high realms of philosophy, I'm dedicating this entry to Anthony's Curry Mela this week (Week No 21). He does a terrific job of rounding up all the entries from various blogs, making it really convenient for lazy people like me to see who's been making what during the week! Anyway, Tony, here's my entry for your Curry Mela this week, and thanks for your efforts! 1. Grind the first four masala ingredients to a smooth paste with 2 tbsp water. Then add the coriander seeds and grind agin until the seeds are crushed but not smoothly ground. Reserve. 3. Blend the masala, turmeric powder and cooked tuvar/toor dal with 1/2 cup water in a bowl, making sure there are no lumps. 4. 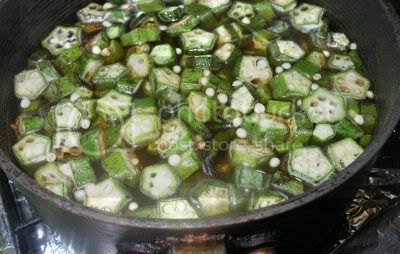 Add this to the cooked okra along with salt to taste and stir carefully to mix without breaking up the okra pieces. Let the pitla simmer for 5 minutes while you do the tempering. 5. For the tempering, heat the oil in a small pan. Pop the mustard seeds (cover the pan) for about 30 seconds on high haet, then lower the heat and add the asafoetida powder and curry leaves. 6. After 10 seconds, pour the tempering immediately on the pitla and stir it in. Serve hot over rice, accompanied by a raita and papad. Have never tried Vendakkai Pitlai. Only make Pagarkkati(Bitter gourd) Pitlai. I have question to ask. Do you have to dry roast/roast in oil the masala paste ? or do you have to grind it raw ? My mother usually fries the bhendi/W salt in little oil before adding it to sambhar or any other gravy/liquid dishes, I coat them in oil, salt and put them in oven for few mins, it does taste and feel different. Hi, first off, I want to tell you how much I enjoy your blog. I only discovered it this week, and I'm having a blast reading your recipe and non-recipe posts. Thank you so much for creating such a warm little spot in the blogging world. Your reference to "kaimanam" makes me nostalgic and teary all at once. My mom had it in bucketloads. With seemingly little effort, she lifted cooking to an art form (mine moves in the opposite direction!). I'm not being biased here; strangers raved about her cooking. I have a question from your recipe for oven-roased baby potatoes. You referred to "molagapodi". Is that regular chilly powder, or is it more than that? I fully understand what you mean by 'Kaimanam'. And yes, it's not something that you can expect from professional chefs really. Btw, I have never eaten Okra cooked this way. You have been coming up with so many ways to cook this sticky thing! This is a new recipe to me too. 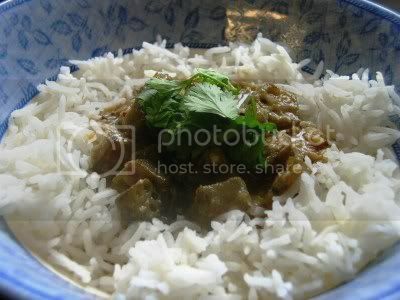 Okra stew in a bed of rice looks very appetizing. Have to try it. I am gonna try your plum chutney too. Krithika - I didnt roast the masala ingredients. I guess roasting would give it a different flavour, kind of like arachuvitta sambar. Ann: I'm really glad you're enjoying reading my blog :) i have fun writing it, so it's good to know that someone has fun reading it! You asked about molagapodi - you're right, it's not regular chilly powder. It's a powder made mainly with roasted dals and chillies. I have a recipe for garlic-sesame podi under the Chutneys list, which can be used for the roast potatoes. It's only one of many variations of molagapodi, though - every family will have their own recipe! Nila: The plum chutney is absolutely lovely as sweet-and-sour sauce! Hope you like it as much as I do. 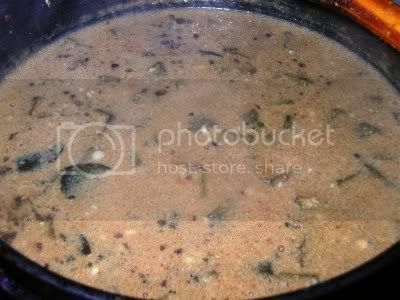 I have tired ur recipe in Vendakai pitlai. It is ok only. 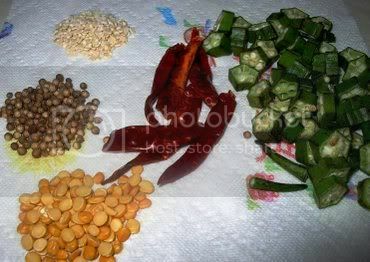 Did u roast ingredients before grinding masala? Hi Rajee - sorry the pitla didnt turn out as well as you were expecting. I didnt roast the ingredients for masala... perhaps I should have! 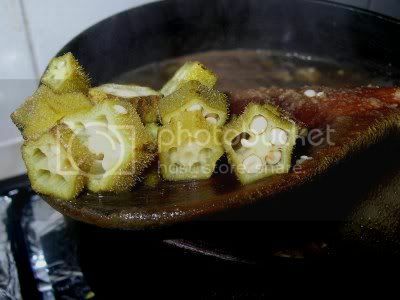 Did the okra pitla come out very well when u cooked it?